Celebrity Scoop | We’ll Give You the Big Dish! We’ll Give You the Big Dish! I always knew that something good would come of my obsession with knowledge of pop culture and everything celebrity. I know my husband was skeptical when I tried to assure him of this; but he has changed his tune after this past weekend. In fact, I think he is actually now encouraging my behavior. The impetus behind this? Our trip to Atlantic City last Friday and Saturday, thanks to Harrah’s. 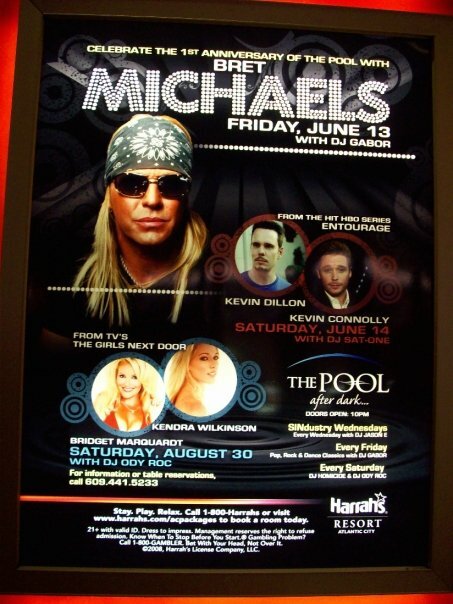 I was invited, along with a few other pop culture bloggers, to cover Bret Michaels’ (of Poison and “Rock of Love“) appearance at the new Pool at Harrah’s, as well as author Jackie Collins’ appearance/book signing at Caesars. But this actually brings me to a point I’d like to make – there is SO MUCH more to do than just gamble at Harrah’s. There’s golfing. A Red Door Spa (I would have been all over a massage had we stayed a bit longer). A state-of-the-art fitness center. Boutique shopping (so much for that $10). Plenty of nightlife events lined up. And restaurants… oh, the restaurants (more on this later). Pretty soon it was dinner time, and we went to meet the other bloggers downstairs. At this point I was treated to one of the most delicious meals I have ever eaten. 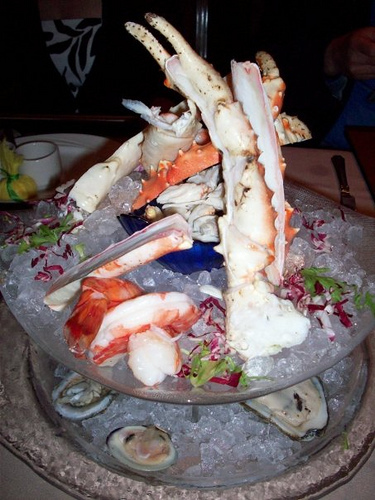 Seriously, if you go to Harrah’s and do not dine at The Steakhouse, just know you are missing out. Big time. In fact, if I find out, I just may never speak to you again. It’s THAT good. I ordered the filet mignon for dinner, which was FAB.U.LOUS. Steve had the prime rib, which was so big he couldn’t even finish it, much to his dismay. Plus, the waitstaff was SO incredibly attentive and knowledgeable. The entire dining experience was absolutely fantastic. Our stomachs full beyond belief, it was then time to head to The Pool for Bret Michaels’ live appearance. Listen, I’m not even going to front and say I wasn’t excited about seeing Bret (I feel we are on a first name basis now). I am going out on an embarrassing limb here and disclose that I went to a Vanilla Ice concert once. Granted, I was in the fifth grade so I was impressionable… but still. It’s brought up in therapy from time to time. So yes, I like Bret. More so “Bret the Reality TV guy” than anything else. Oh, how I love me some “Rock of Love.” And judging by the line of people waiting to get into The Pool, I’m not the only one. For the first time in my life, though, I didn’t have to wait in line. We were part of the VIP crowd, baby. Sure, it was for one night only… but that’s beside the point. Then Steve and I decided to saunter on over to Bret’s cabana (we knew he had arrived on account of the high-pitched screams from across the pool). He was working the large crowd around him, trying to give everyone equal time for pictures and autographs. He was clearly enjoying himself; who could blame him? So our party decided to call it a night. Later I heard that Bret had played his set at 2 AM. If only we had waited another half hour (surely there were more pictures of the bar lighting to be taken). 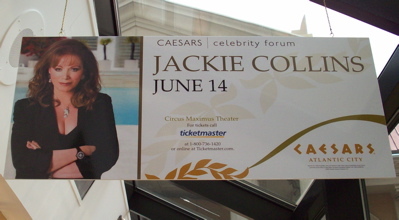 The next morning, Kate, one of the fabulous people on the Harrah’s PR team, hooked us up with tickets to see author Jackie Collins’ lunch appearance at Caesars. I’m really an equal opportunity reader. I am just as happy with a “romantic fiction” novel as I am with a Jane Austen selection, a book about American history or a collection of essays about dogs. And Ms. Collins’ novels, especially, are on my list of must-reads at the beach each summer. (Yes, I’m going with Ms. Collins here because, well… she’s British and proper and respectful, and her name should be too.) So needless to say, I was excited about this event. There were between 250-300 people at the lunch. We dined on delicious salad, lobster and dessert while Ms. Collins answered audience members’ questions. Naturally, she was a phenomenal storyteller, and kept us all entertained with stories about her life’s adventures, as well as the adventures of her characters. Plus, doesn’t everything sound more interesting when it’s said in a British accent? When we finally got to meet Ms. Collins, she was just as beautiful in person as you’d expect. I told her that my sister, my Nana, my Grandma and I all love her novels. I also mentioned that my sister swears by the Boo Boo Gel Packs that Ms. Collins’ daughter, Tiffany, carries in her Tiny Tillia product line. This is true – with 4 boys under 4 years old, keeping these cold gel packs on hand in the freezer is a necessity for my sister. I must say, the woman’s got good taste. And on that note, we all posed for a picture. If we superimpose the dogs in, this could be our Christmas card photo, no? With that, it was time for our trip to Atlantic City to come to an end. I hope I have captured even a part of just how wonderful the whole experience was for us. Scott Baio and his wife Renee have opened up about their daughter’s health scare to Celebrity Baby Blog. Just a day after the couple brought her home, they were told that Bailey DeLuca Baio, who was born prematurely last November, had tested positive for GA-1, a potentially fatal metabolic disorder that can cause seizures and lead to coma. It was not until little Bailey DeLuca was 10 weeks old, and after several tests, that Scott and Renee received the news that their daughter did not have the disorder. The original test had been a false positive. During those 10 weeks, the couple married and showed no outward signs of the struggle they were going through with their new baby. Now 7 months old, Bailey is a healthy little girl, but her parents would like to use their experience to help others. And hey are in the process of establishing a foundation to do just that. Based off the ever-so-popular American Girl book series, ‘Kit Kittredge: An American Girl’ made its long-awaited premiere in Hollywood. And the stars turned out – with their children! Will Smith and Jada Pinkett Smith were there with their little girl Willow, who also stars in the movie, as well as Chris O’Donnell with his wife and 3 of their 5 children, Joan Cusack, Julia Ormond, Glenne Headly, Jane Krakowski, Wallace Shawn and Stanley Tucci. ‘Kit Kittredge: An American Girl’ stars Abigail Breslin as a resourceful young girl living during the Great Depression. Her bravery, compassion and determination help her solve a mystery that saves her family’s home. ‘Kit Kittredge: An American Girl’ opens nationwide on July 2nd. Madonna’s brother Christopher Ciccone has signed a deal with Simon and Schuster to pen a tell-all book about his famous sister. “Living With My Sister Madonna” will chronicle Christopher’s 47-year relationship with his older sister and will have an initial print run of 350,000 copies. Though she and Christoper collaborated together in 1991 for her documentary ‘Madonna: Truth or Dare’ and again in 1993, when he designed and directed her ‘Girlie Show’ world tour, Madonna is no longer close to her brother. Actress Tori Spelling, 35, and her husband Dean McDermott have welcomed their second child, a baby girl, Stella Doreen McDermott. Weighing 6 lbs, 8 oz, and 19 3/4 inches long, she was born at 3:13 pm on Monday, June 9th, at Cedars-Sinai Medical Center in Los Angeles, CA via c-section. It has been reported that she is a healthy baby girl and that Tori and Stella and resting comfortably. Stella Doreen (her middle name is after Dean’s late mother) joins 2 big brothers, Liam Aaron, 15 months, and Jack, 9, from Dean’s previous marriage. Jamie Lynn Spears and her fiancé Casey Aldridge are tirelessly preparing for their baby-to-be. The young couple recently purchased their first home together in Liberty, Mississippi and are setting up one bedroom as a very girly nursery for their little girl, due to arrive very soon. The couple has also apparently furnished the rest of the house with furniture including an elaborately carved four-poster king-size canopy bed, a leather recliner, and a leather sofa. The couple is planning to wed after the baby arrives. Angela Kinsey updated her Myspace page! Hi Dunderheads! I just wanted to say hello and let you know that I am working on my “new Mom” blog between feedings and naps and will try to post it soon. And I wanted to thank you all for your sweet messages. Your support when it comes to my career and my life are so appreciated. I am in the process of going through the lovely letters and packages you all have sent me. Thank you for your kindness. I am going to venture out of the house this weekend and perform at the I.O. West Improv Festival Saturday night along with Creed and Oscar (www.iowest.com) in the Armando Show, and Sunday I’ll be attending the TV Land Awards with several members of the cast. I definitely do not feel red carpet ready. The ol’ body has not gotten back to normal but hopefully I can find some dress that hides what I need hiding. 😉 And I can’t wait to tell you all about little Isabel! She is amazing. Angela and her husband Warren welcomed Isabel Ruby on May 3rd. Read our interview with Angela Kinsey HERE! Read our exclusive Pinks & Blues interview with actress and Crowned star Shanna Moakler! Click on our Pinks & Blues logo for your Trendy and Ultra-Hip Daily Picks! Jane, Sharon and Audrey, The Pinks & Blues Girls, are a mother and two daughters who have a blast together, each and every day, finding fabulous products to blog about on their site Pinks & Blues! This blog is their place to share, laugh and connect with the rest of the blog world! 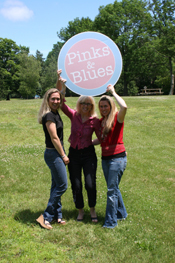 To learn more about The Pinks & Blues Girls, click here!